StyleBlog’N: Scarves with replicas is a new direction in Armenia. How was the idea of founding “Artuyt” born? Arevik: In a way “Artuyt” became a combination of my three passions: fashion, art and history. Being an inquisitive person, I always enjoy various art exhibitions, galleries and museums. The idea of “Artuyt” came to me while visiting the Van Gogh museum in Amsterdam. Next to the impressive collection of the gallery, the assortment of the museum shop caught my attention. Especially I loved beautiful souvenir scarves with replicas of Van Gogh, that gave a chance to visitors to take “a piece of Van Gogh” with them. 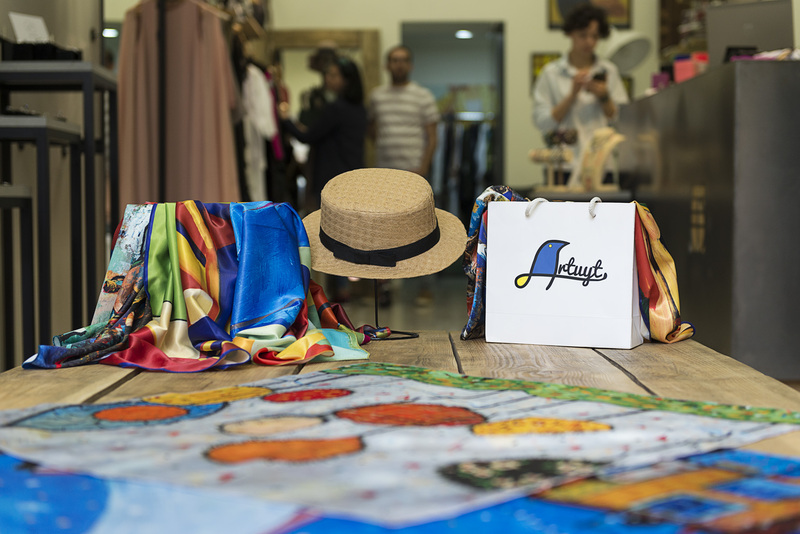 There are many talented contemporary artists in Armenia, the aim of “Artuyt” is to raise awareness about these artist and their creations through timeless scarves. StyleBlog’N: Translated from Armenian, ARTUYT is a SKYLARK – a small passerine bird species. Why did you call the brand “Artuyt”? Arevik: In Armenia the skylark (artuyt) symbolizes the start of the spring, the rebirth of nature. In this context the name “Artuyt” stands for something new. Besides, “Artuyt” includes the word “art” that represents a clear connection of the brand with art. StyleBlog’N: What fabrics are being used for Artuyt scarves? Arevik: At the moment our scarves are being made from atlas silk. In the future we are planning to expand the collection using luxurious Italian silk. StyleBlog’N: How many artists do you cooperate with? What styles do they represent? Arevik: Currently our collection includes the artworks of three contemporary artists: Karen Smbatyan, Mihran Avetisyan and Tatev Ghambaryan. Smbatyan’s style is a mix of contemporary with classic. Thanks to successful use of daring color combinations, art-lovers call him “the knight of colors”. Mihran Avetisyan works in the style of abstractionism. Tatev Ghambaryan combines lyrical dreams and reality. StyleBlog’N: Next to cooperation with artists, “Artuyt” also contributes into the development of “museum shop” culture in Armenia. What museums do you cooperate with and how? Arevik: Indeed, we are actively contributing into the “museum shop” culture in Armenia. Currently we are cooperating with three large museums in Yerevan: Matenadaran Manuscript Museum, Yervand Kochar Museum and Sergei Parajanov Museum. For each museum we have developed a special edition collection that is possible to purchase as a souvenir in a museum shop. For example, specially for Matenadaran Manuscript Museum we have created a collection of scarves with medieval Armenian stamps and unique ornaments dating back to 16-17th century. StyleBlog’N: Besides museums, where is it possible to purchase “Artuyt” scarves? Arevik: Next to our online shop: www.artuyt.com, our scarves can be found in a concept store “5 Concept” on Teryan 65 Street, Yerevan and in “Muraba” shop on Moskovyan 24 Street, Yerevan. StyleBlog’N: I know that you have plans to exhibit the new collection of scarves in Milan. What can we expect in the new S/S 2018 collection? Arevik: Indeed, this year we are going to present our S/S 2018 collection in one of the famous fashion showrooms in Milan, Italy. Our new collection is based on collages of Sergei Parajanov – a well-known film director and artist of Armenian decent. His extraordinary and surrealistic style finds its place in the hearts of many artlovers. I think that our new collection of scarves replicating Parajanov’s masterpieces will become a beloved accessory in the wardrobe of every women. StyleBlog’N: All scarves are so beautiful, it is a real challenge to choose one. Do you have your favorite scarf? And why is that your favorite? Arevik: It’s a very difficult question to answer. The choice is hard for me too, but “Fairytale motif” by Karen Smbatyan, “Confession” by Mihran Avetisyan and “Cat, Sushi, Woman” by Tatev Ghambaryan are my favorites. I like “Confession” because of its beautiful mix of colors, plus it was our first scarf! “Fairy tale motif” attracts me by its playful mood that reminds me of my childhood. “Cat, Sushi, Woman” radically differs from all the other designs with its joyful motif. Thank you Arevik for such an informative conversation! I wish you all the best with the upcoming presentation in Milan and looking forward to our next meeting! This was it for this time. I hope you enjoyed this post! Don’t forget to let me know your opinion in a comment bar below! Till next time! P.S. I had really a hard time of choosing one of the scarves to purchase. Eventually I have stopped my choice on this piece by Karen Smbatyan. Nice post, written beautifully. Keep writing and inspiring.